For most of my life, this wasn't much of an issue, because I could easily rearrange my schedule and do a friend a favor without too much inconvenience to myself or to others around me. That all changed, however, once I got married and had a child. Suddenly, I had to put my daughter first, even if that meant displeasing other well-meaning relatives and friends. I had to learn to say "no." Most of the time, I discovered that saying no wasn't as difficult as I thought. Most of my friends understood my circumstances, and thought no more of it. However, there remained a few people who just didn't understand why my daughter needs to be in bed no later than eight, or who assumed that because I work from home, I was free to run random errands for them during the day. There were still people who refused to take no for an answer, or who simply took my refusal personally. For those people, I needed (and still need) to be both firmer and more diplomatic in saying no. Here's what I've learned about saying "no" so far. Sometimes I dread saying no to a friend who is notorious for not taking no for an answer. However, I'm often pleasantly surprised when I honestly tell them my reasons for saying no. "I just can't afford to go there," or "Honestly, it's just going to be too stressful for me to drive that far with the baby," are two responses that I've used successfully and I've found that the other person usually appreciates the frankness. This idea might sound like a bad date movie, but sometimes it's a good idea to equivocate and to delay committing to something. Perhaps, like me, you tend to say yes when you're put on the spot (or as I like to put it, when I've been ambushed). I find it helpful to say, "Let me check my schedule (or with my significant other) and get back to you," or simply, "I may have a commitment that day, so let me get back to you." Later, once you've thought about it, phone or send a succinct note stating a firm but polite no. If a friend asks you to do something that's out of your comfort zone, you can be honest that you're not comfortable doing it and that someone else might do a better job. "I'm honestly not that great with kids. Why don't you ask another friend to babysit instead?" Or, "If I were on that committee, I wouldn't be able to give the issues the time and attention they deserve." Of course, this response invites argumentation ("Oh you hardly have to do anything! Just put a movie on! "), so it may take a bit more explaining to convince the asker (especially those who don't take no for an answer) that you're serious. Some people take your refusal as a rejection of them personally. Show them that you like and appreciate them, but that you simply can't comply with their request. For example, if you hate the thought of going to a poetry reading, but wouldn't mind spending time with your friend elsewhere, suggest lunch on another day instead. If you can't make it to a party, tell your friend how much you like her parties and how you appreciate the effort they put into throwing these get-togethers, but you can't make it this time. Although you may assume that your friend or relative knows how much she means to you, you'd be surprised how much she enjoys hearing you put your appreciation into words. Sometimes not explaining is more effective than explaining. "No, I'm sorry, I can't make it. I have an appointment." Or, "I'm afraid it's just not going to work out." No need to explain further. Most people will respect your privacy enough not to pry. If your friend does get nosy, a simple "I'd rather not get into it," should suffice to keep further argument at bay. Remember, you're not obligated to explain yourself or to justify your decision. There needs to be some privacy and autonomy left in the world! Do you have a problem saying no? What method has worked best for you? I like #2. I use the common phrase: "let me think about it..." all the time to delay committing. I guess I like number one best. I have no problem saying no. Tough love. Its what I grew up on and am thankful for it. I'd done all of this except # 3....It is effective based on my empirical knowledge. 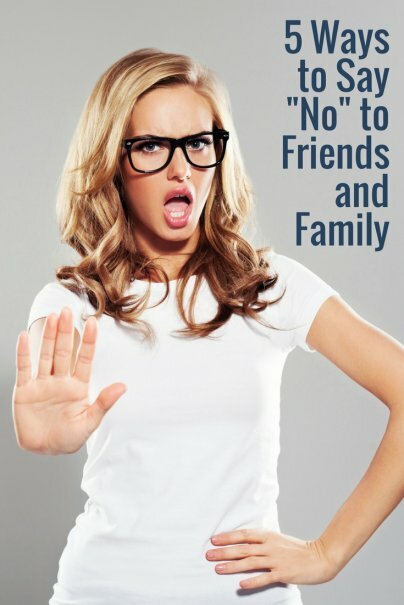 I found this article because I am having a really hard time saying no to my family who "ambush" me every chance they get. I work from home as well and they just don't get it. I am now in the awkward position where I had to say yes to a week of babysitting when I really can't / don't want to do it. I feel terrible and it's probably too late to say no now... The next time, I will be trying #2 or 3, but some people just don't get it. I am pretty sure they will be angry at me for saying no. With respect, ma'am, the majority of these suggestions are reliant on using your child as an excuse. There is no doubt becoming a parent shuffles priorities and eats up your time, and if that were truthfully the sole reason you said no, that's fine. It doesn't really help if someone wants to say no and has no such person to blame for it though. Otherwise, honesty ticks off family and loses friends, while lying can get confusing if you're bad at it.